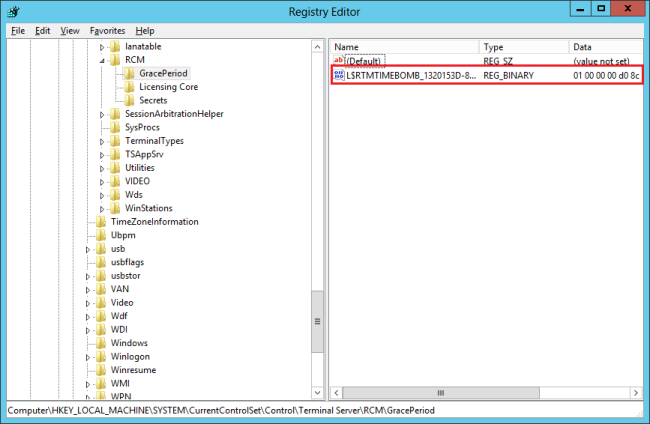 The RD Licensing grace period has expired and the service has not registered with a license server with installed licenses. A RD Licensing server is required for continuous operation. 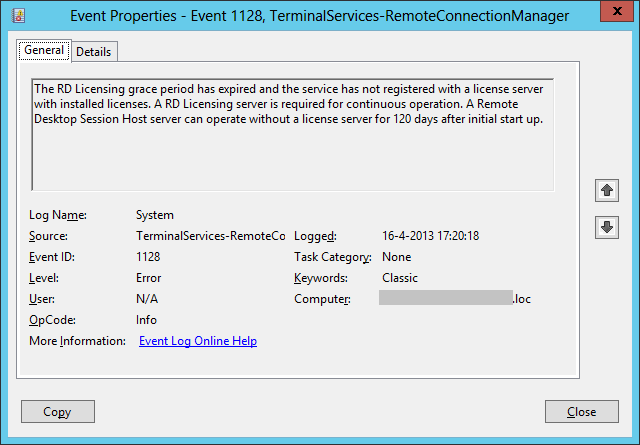 A Remote Desktop Session Host server can operate without a license server for 120 days after initial start up. Note: you must take ownership and give admin users full control to be able to delete this key. Can I Backup Exchange 2010 with My Online Backup Software? My Site Has Been Migrated to ByteHouse. How Do I Test Functionality Before Re-pointing DNS? How Do I Update My Plesk Product License? How Do I Backup in Plesk 10.4.4? How Do I Deploy WordPress in Plesk? Why Can’t I Log Into FTP on My Domain? Why Am I Still Unable to Log Into My FTP Accounts? How Do I Set Up Email Addresses for Our Domain? How to Deal with ‘Low Disk Space' Condition on Your Dedicated Server. What is inode & how it affects my VPS ? What are the NameServers used by ByteHouse ? How to Purchase RAM Upgrade? What are the file permission requirements when DSO PHP handler is used? What is the Difference Between Dedicated IP & Shared IP in Plesk? How to Search for a File in Linux? How to Find a File Containing a "Keyword" in Linux? What is Plesk Watch Dog & How to Use it? My Emails are Bounced Due to Blacklist, What Can I Do? How to install modules for PHP, Ruby, and Perl via WHM. WHMCS Client Area: What are Onapp Backups and how do I manage Onapp Backup ? WHMCS Client Area: How to view & pay outstanding bills ? Troubleshooting problems with Mail Client connecting to server. © 2001 - 2013 by phpMyFAQ Team under the Mozilla Public License. All rights reserved.